Irritable bowel syndrome or IBS has various causes and perpetuating factors and is often a co-condition with fibromyalgia. To make matters even more complex, fibromyalgia affects multiple systems in the body, and one of those “vulnerable” systems is the GI tract. IBS is also known by a variety of other names including spastic colon, functional dyspepsia, mucous colon and more. It is not to be confused with IBD, or Inflammatory Bowel Disease, a more serious bowel disease. Working as a colon therapist, I have seen many different digestive diseases, and of course even for those with fibro, not every digestive issue is a result of having fibromyalgia. There are many perpetuating factors including gut bacteria, stress and individual food intolerances. A very real physiological disorder, Irritable Bowel Syndrome is thought to be connected to a disruption or disorder in the enteric nervous system. The nerve supply in our “gut brain” alters perception of pain and stimuli. The nerves within the GI tract become overly sensitive to stimulation, environment and foods ingested. Sounds a lot like fibromyalgia itself, right? And if you have IBS, you are not alone in your frustration when otherwise “healthy” foods can cause severe GI distress and uncomfortable symptoms. In irritable bowel syndrome, the normal muscular contractions in the colon become irregular and dysregulated. The movement of food and waste can either speed up or slow down. This can result in trapped gas, distention and pain when food and waste are not moving along properly within the GI tract. Allergen foods, medicines and stress can cause intestinal spasms and pain. Food allergens are found in over half of all cases of IBS. The more common food irritants in IBS include wheat, corn, citrus, dairy, and chocolate. These reactions can also be part of a histamine intolerance, and you might need to consider eliminating foods high in histamine. Coffee and tea are also suspect for some people especially if there is a sensitivity to caffeine. You could also react to pesticides and gmos in foods and drinks. That is why we want to strive to eat at much organic non genetically modified food as possible. If you feel shaky or irritable even after drinking decaffeinated coffee, it could be related to pesticides used in the coffee beans. Irritable Bowel Syndrome is more prevalent among women. Hormones can play a role in IBS and women with IBS tend to have more symptoms before the menstrual cycle. IBS is more commonly diagnosed before the age of 45, with less incidence in older ages, although some people report having symptoms since a young age. Again, this correlates to fibromyalgia and the propensity to disruption in the GI tract and enteric nervous system. Other causes include infections, candidiasis and/or parasites. NOTE: A PROPER MEDICAL DIAGNOSIS IS IMPORTANT TO EXCLUDE THE POSSIBILITY OF OTHER GI DISEASE OR INFLAMMATORY CONDITIONS SUCH AS COLITIS OR DIVERTICULITIS. As a colon therapist, there are a few things I use and recommend when living with IBS. Remember that with both fibromyalgia and irritable bowel syndrome, the symptoms will often overlap and can also vary from day to day in severity. Please refer to the list below including my favorite probiotic with HSO's and some other effective non invasive remedies. First, it is important to avoid ingesting too many heated oils. Raw fats and oils are better tolerated. The right kind of fiber is also essential, as some fibers are very irritating to the colon and GI tract. Some packaged foods are now including a type of fiber called INULIN, or Chicory Root and this fiber, actually a “pre-biotic” can cause upset in a sensitive bowel. This prebiotic is good in itself, but just like other healthy foods, not everything is right for the sensitive bowel. Some of the fiber bars and supplements on the market also contain INULIN or chicory root. If bloating or nausea occur after ingesting INULIN, it is best to eliminate this form of fiber, especially while symptoms are present. If you are eating those heavily marketed packaged fiber bars, check the ingredients for these fibers. There are many effective probiotic supplements on the market today. As a colon therapist working with clients for many years in the field of gut health, I recommend a probiotic with HSO's (homeostatic soil organisms) to balance gut flora and aid in both absorption and assimilation of nutrients. Garden Of Life Primal Defense is one of the best along with Flora Udo's Advanced Adult Probiotic which is a great multi strain formula and I have personally used and recommended these two with great results over many years. Working as a colon therapist, I have tried many different brands of probiotics over the years. 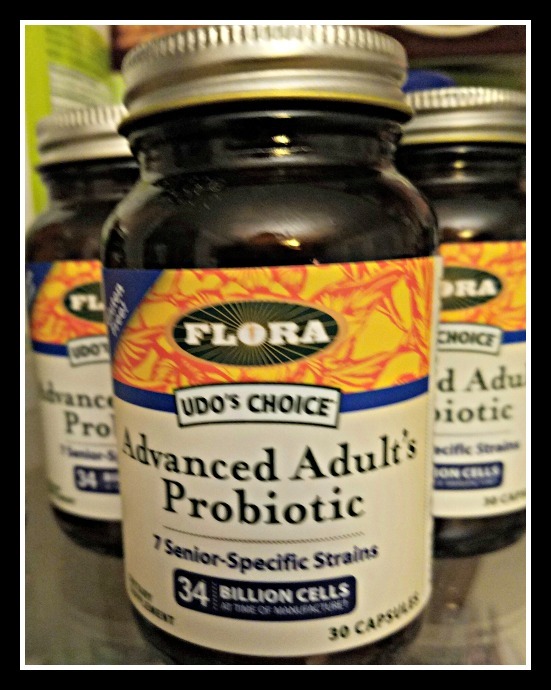 I recommend Udo's Flora brand of probiotics because it is a good quality, multi strain, highly effective probiotic at the best cost we have found as well. This probiotic also contains a good amount of the strains that I prefer to have included such as plantarum, bifidum, and casei. As you continue to improve gut health, you may not need to take probiotics every day. This can help to keep your supplements more cost effective as well. Avoiding excess toxins and allergens in our diet is really the best way to go. Supplements can aid an already healthy diet but they cannot take the place of a good diet that promotes good absorption of nutrients and essential minerals. As a colon therapist, I work with many different digestive conditions, but one thing I recommend for all of them, especially irritable bowel, is weekly practice of juicing or blending. See, I say weekly, because you need to do what works for you in terms of your schedule, cost, etc. and how many days you will be vegetable juicing or blending. For those who are very sick, I recommend vegetable juicing first, not blending. If there is irritation in the GI tract, we want to bypass digestion. That is the great value in vegetable juicing. Some people think they have an intolerance to garlic for example, but when we juice garlic, not blend, this can be well tolerated and help with bacterium that might be exacerbating your intestinal symptoms. I highly recommend reading my juicing and blending page, << and referring back to it as you can to really understand and read between the lines. I have been vegetable juicing for almost 30 years now, and I love sharing the great benefits when done properly. This is not about perfection, but learning the ways to make it more effective. These foods can cause fermentation in the GI tract. 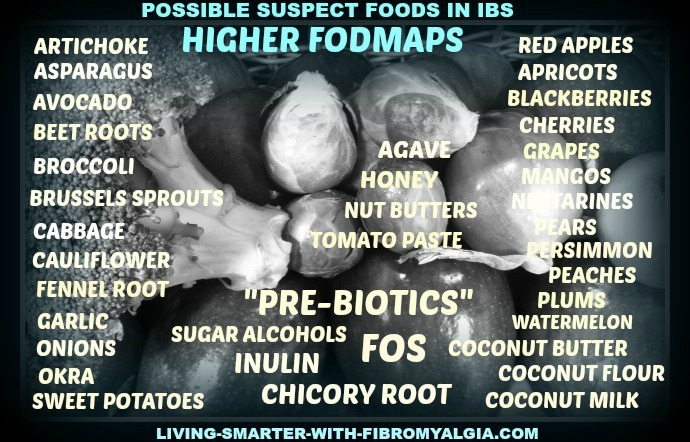 FODMAPS can be difficult to ascertain, but it basically means foods higher in fructans, an irritant to a sensitive bowel; however, not all foods higher in fructans will be "suspect" in regards to foods to which people with IBS react. FODMAPS can be helpful to ascertaining food intolerance but not all will apply to every person. Don't worry!! Most people will not react to all the foods listed in the FODMAPS graphic below. As a general approach, when working to eliminate suspect foods, it is a good idea to keep a food journal to help ascertain which foods are causing IBS issues. When working with clients, I use a combination of both blood type and FODMAPS to create a GI friendly food plan. But again, a food journal can support us in better determining which foods we are reacting to. Eliminate any "suspect" food for 2-3 weeks and then add back individually to determine tolerance. One of the foods/oils that I am finding more suspect and seeing more intolerance to is coconut and coconut oil. More people are using coconut products these days but they are not right for everyone. If you suspect you might have an allergy to an otherwise healthy food, check with your doctor. It is also important to rotate foods, every 2-3 days when possible. I believe in rotating the more concentrated foods such as oils and animal proteins. You may like to eat the same vegetables more often, but rotating oils and proteins will aid in metabolism and avoidance of developing a sensitivity to any one particular food. The above graphic shows the foods highest in FODMAPS (fructans). But again, not everyone will react to the same foods. With a histamine intolerance for example, you might have to avoid all citrus fruits and all types of vinegar but you might find you can tolerate a high quality raw chocolate on occasion. 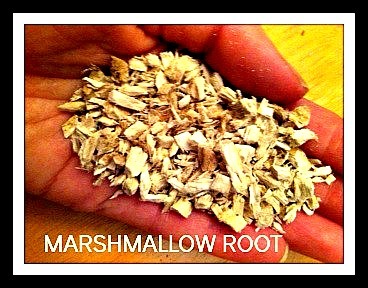 Marshmallow Root in the form of tea. This root is very soothing to the mucous membranes, GI tract and urinary tract. This can be steeped and used alone or with other herbs of detoxing nature. Look for it in your favorite health/bulk herb department. Flax seed tea. Very soothing and healing to the GI tract. Simply soak 1-2 tsp. of flax seeds in 10-12 oz. of water overnight or about eight hours. In the morning, strain the water to drink. The seeds (which become soft) can be consumed as well; however, the liquid is more for healing when the bowels are irritated or inflamed. Slippery Elm Bark Powder. This powder can be used with another form of fiber or taken alone. It coats the intestinal lining for soothing bowel irritations. L-Glutamine powder. We reference Glutamine in the Leaky Gut article. It is an essential for healing the gut and as nourishment for muscle and brain. Fennel Seed is excellent for expelling gas from the colon when you are feeling bloated or have indigestion. Also look for this in the bulk section at your health food store. Peppermint is also good for digestion and soothing the GI tract. Use after meals if needed in the form of tea. What about vinegar/foods with vinegar? So there is a lot of information that gets repeated on the internet that is not always true or good for you. Some people say it's a good idea to drink pickle juice. I never advise anyone to drink straight pickle juice, and most are not suitable anyways as they contain gmo white vinegar. Always dilute your vinegar when drinking it. We always want a good balance of acid versus alkaline. Working as a colon therapist, I work closely with the digestive system and believe that moderation is important. Check out our Recipes and Blending & Juicing pages for some simple recipes, both raw and cooked and all gluten free. In many of the recipes, vegetables are shredded, juiced or blended. For instance, garlic may be difficult for some people to digest when raw or blended, however I have found that when juiced with vegetables, it is well tolerated. With Irritable Bowel Syndrome comes the tendency to avoid raw salads and vegetables. This is where preparation is so critical to be sure that we are still getting "living" nutrients into our cells on a regular basis. If ever it seems that eating raw foods is just not working with your IBS symptoms, consider vegetable juicing.The absolute best way to absorb and utilize nutrients is through juicing. Even blending is not appropriate when symptoms of IBS might be flaring. Use the above link to our juicing article. When eating salad greens, the better options are going to be green leaf lettuce, spring mix or spinach. Romaine or iceberg lettuce are often harder to digest with IBS. Save romaine for juicing as it is very good for the adrenal glands when juiced. If eating romaine, cut away the inner white part and just use the outer green leaves for better digestion. PROBIOTIC foods as detailed in the 'Nutrition Tips' article are also necessary to feeding the good bacteria and healing terrain. Low levels of serotonin have been seen in fibromyalgia and can be "suspect" also in IBS, however not everyone can tolerate oral supplementation to increase serotonin, as in the form of 5-HTP or tryptophan. And, this can actually contribute to constipation in some people. I do believe the best recourse for IBS management is through diet and then supplementation if needed. Also read more here about Leaky Gut symptoms and additional suggestions if needed. Stress reduction techniques. We have many articles throughout the website on meditation and mind body science. 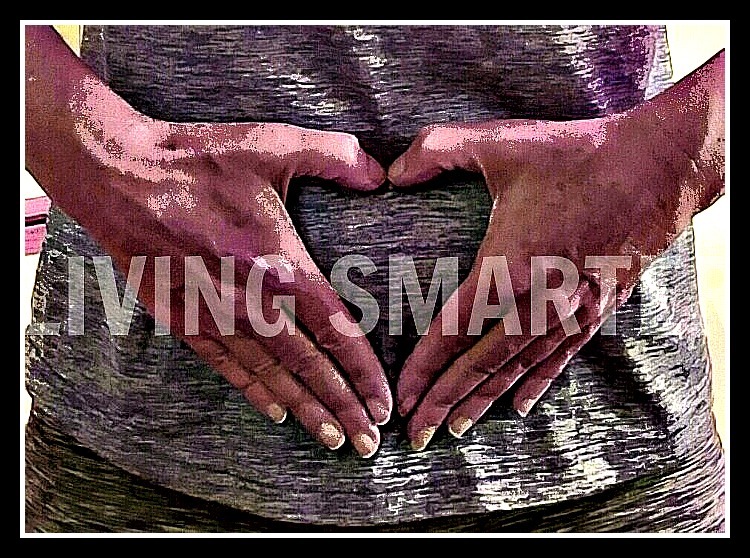 Whatever works to reduce stress is essential when living with any chronic illness, but especially with fibromyalgia and irritable bowel syndrome when our bodies are on high alert and more sensitive to stimulus of all kinds. Thank you for reading. Lisa. FG.